Cider season is upon us and there is nothing quite like fresh-pressed apples. I live in an area with a lot of farms and orchards and this time of year it’s not uncommon to see coolers full of fresh cider next to a donation bucket to drop your payment. 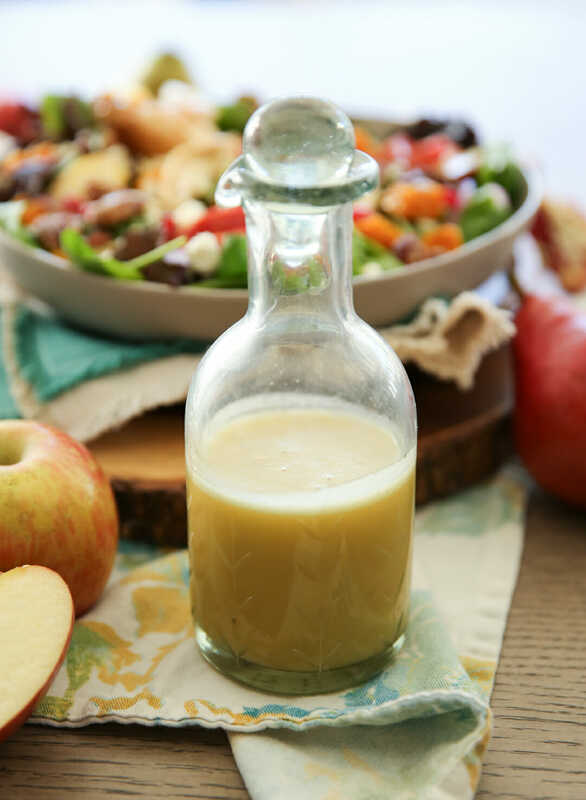 We picked some up last weekend after taking some family photos in an apple orchard and I knew I wanted to use a little for this Honey Cider Vinaigrette. If you’re making this at home, look for quality cider in the produce section of the grocery store. This time of year you will usually find it near the apples! This sweet and tangy mix only requires 3 main ingredients. I keep the ingredient list minimized to really let the flavors of both the honey and the cider, shine. This dressing is amazing paired with things like spinach and crispy apples or sweet pears. I’ll share my loaded Harvest Salad with you guys later this month! 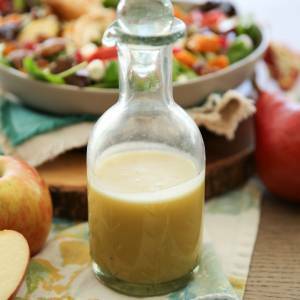 For this Cider Honey Vinaigrette you’ll mix some apple cider, apple cider vinegar and sweet honey in a blender. You’ll then drizzle in some oil. 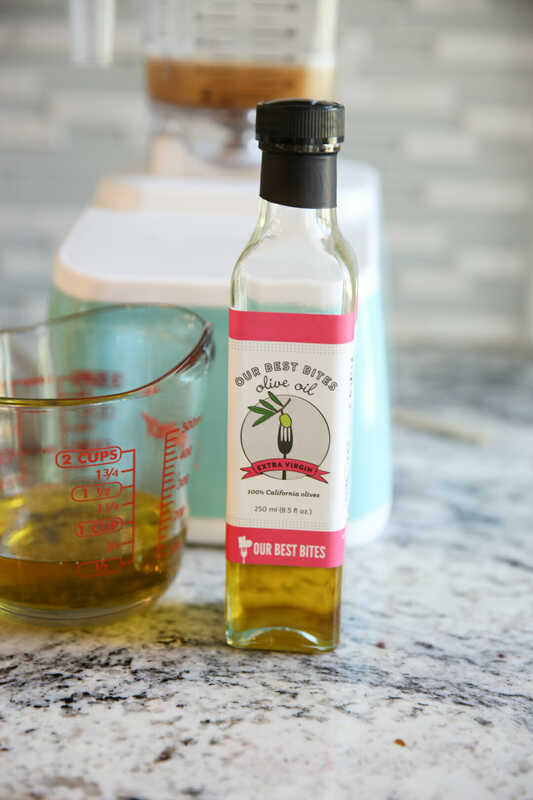 You’ll want to use a good olive oil- click here to shop our line of artisan oils, or a vegetable oil would work as well if that’s all you have. 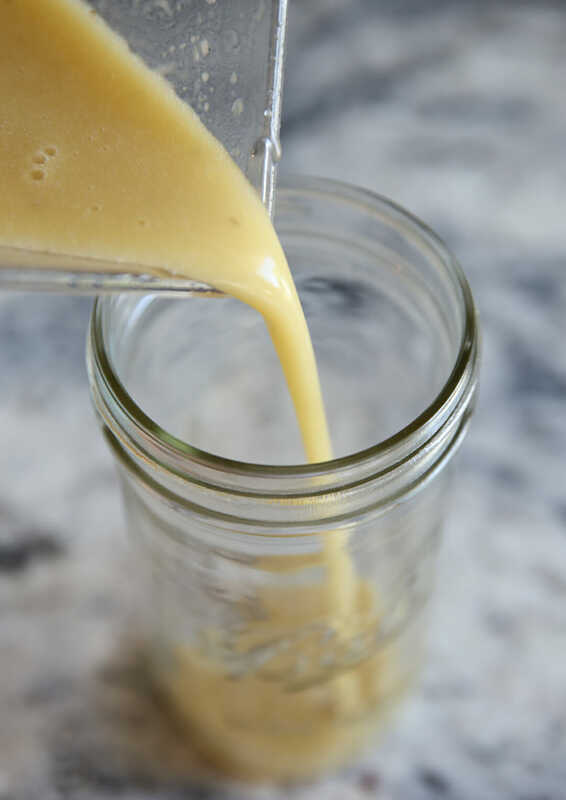 One of the secrets to a great vinaigrette is drizzling in the oil in a slow and steady stream while your blender is running (or while you feverishly whisk). I know sometimes people get rushed or lazy and just dump it all in there. Your dressing really will turn out better if you take the time to slowly drizzle it in. You’ll get a thick, smooth, and creamy dressing that’s fully emulsified. I can’t wait to show you the salad I made to go with this, but that will have to wait. You’ll love the sweet simplicity of this dressing, and how great it is on autumn salads! Take advantage of cider season and whip some up today! Looking for more salad dressings? If you didn’t know, they’re kind of our thing. Click here for our full dressing collection. A sweet and tangy dressing perfect for hearty salads with apples, pears, berries, spinach, nuts, and more. With lid on and blender speed running on low, slowly drizzle in the oil in a small steady stream until fully incorporated. If desired, add additional salt and pepper to taste. Can you help me understand what makes dressings turn out too watery? I tried this one last week and it was one that just ended up too runny! I like a dressing that has a little body to it. When there is a dressing with yummy flavor but isn’t thick enough the flavor gets lost. What can you do to thicken it up a bit? Hey Nicki! 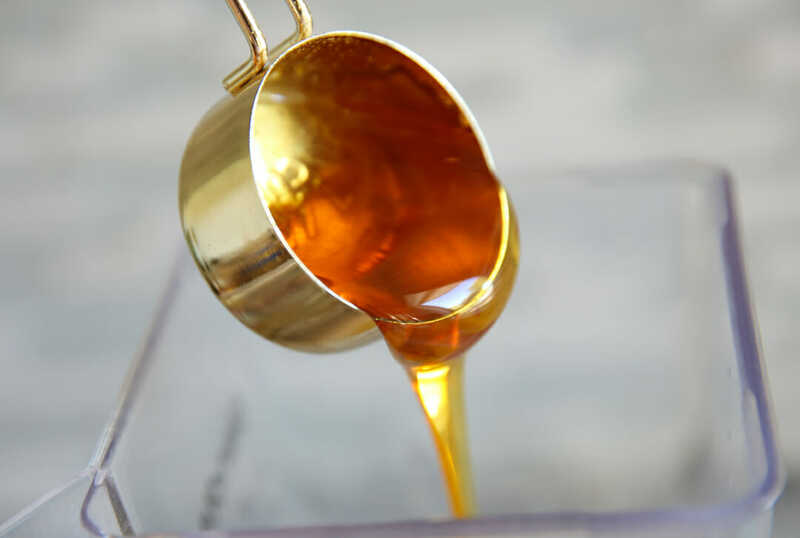 If your dressing is turning out way too thin, then the proportions of oil to liquid or off (which isn’t the case in this dressing) OR it’s not properly emulsified. 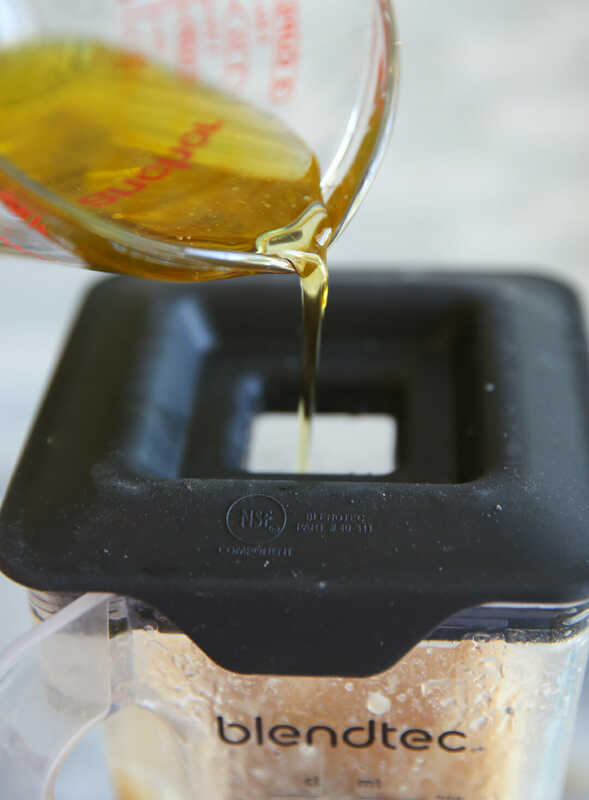 You’ll want to make sure you are adding your oil in a very slow, thin stream while a blender is running at low speed so the emulsification process happens correctly. Hope that helps!